As with any product, it is important to buy quality so that way you only have to buy once. That couldn’t be any more factual when it comes to brew kettles. 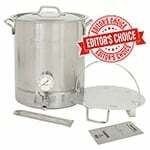 If you spring for a cheaper brew kettle, you are going to be facing a short lifespan along, and you’ll also most likely be omitting some important features that come in really hand when you’re homebrewing, especially when doing it by yourself. 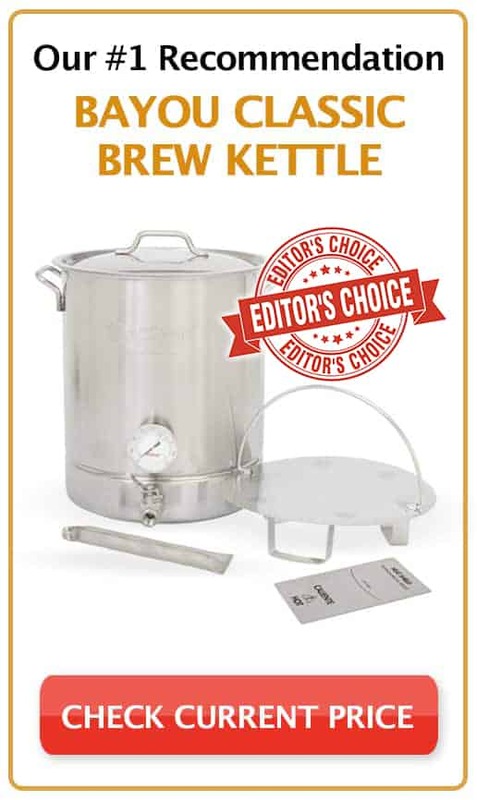 Do yourself a favor and pick a quality brew kettle right from the get-go! Since most people brew around 5 gallons of beer, the perfect brew kettle size is approximately 8 to 10 gallons and should be constructed from thick, high-quality stainless steel. I’d also prefer a built-in thermometer, ball valve and the option to convert to a mash tun. Not all these features are required to brew but are more of an extreme convenience. After careful testing and analysis of several kettles on the market, we’ve filtered the good from the bad. For a quick comparison of our top recommendations, check out the table below. 2 What’s the Best Brew Kettle? Bayou Classic is a popular outdoor equipment supplier. They focus on a wide range of outdoor food grade utilities. Their products range from coolers, cookers, fryers, camping, and home brew supplies. The Bayou Classic Brew Kettle is a 10-gallon high-quality homebrew pot. It combines many different features to bring you an efficient and convenient brew experience. This kettle is great for bag brewing methods, but it also doubles as a mash tun which you need for all-grain systems. If you’re the kind of person that wants the best of the best, this is our recommendation. SS Brew Tech hasn’t been around for very long, but they sure have made an enormous impact on the home brew world. Since launching in 2013, they’ve created several innovative features that no other home brewing supply company offers. Some of these features are incorporated right into their brew kettles! The SS BrewTech Kettle comes in 6 different capacity options including a 5.5, 10, 15, 20, 30, and a huge 50-gallon size option. 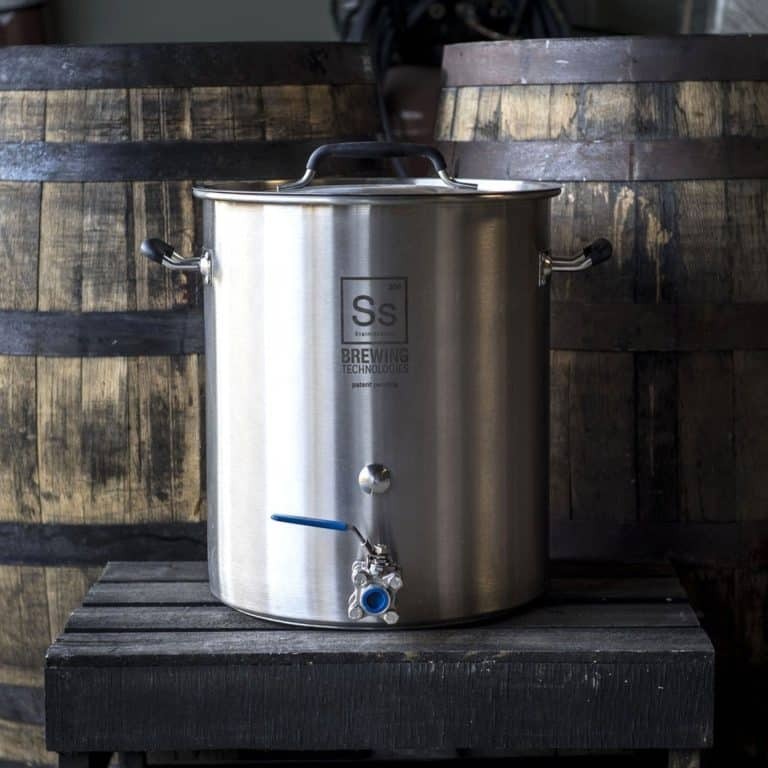 SS Brewing Technologies constructs their brew pots from heavy-duty, 18-gauge, grade 304 stainless steel and a tri-clad bottom (similar to the Spike Brewing Kettle) to prevent scorching. Also included is a ½” ball valve, etched volume markers, optional thermometer, and their first ever integrated trub dam and pick-up tube assembly, which you won’t find on any other home brew kettle. This is an excellent choice if you’re looking for something that has plenty of features and is built to last without entirely breaking the bank. The MegaPot 1.2 is an excellent choice for anyone that is looking to buy a quality homebrew kettle that they won’t have to replace a year down the road. 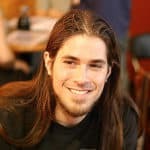 They’re a popular name in the homebrew world, and it is definitely for a reason. It comes in 5 different capacities: 8, 10, 15, 20, and 30-gallon sizes. The pot is made of high-quality stainless steel that has 1mm thick walls and a 4mm tri-clad bottom for even heat distribution. It also comes with convenient volume markers inside the kettle to give you accurate measurements. Depending on which configuration you choose, this stainless steel unit can even come with a built-in thermometer, ball valve, and the optional false bottom for an all-grain mash tun. Models are available with or without ball valves, thermometers, and false bottoms. Thick walls and a 5 mm-thick bottom to aid in heat dissipation. 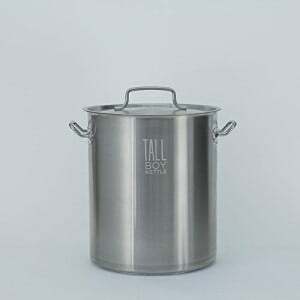 Tall Boy brew kettles are a stainless steel budget-friendly option that will get the job done without breaking the bank. Since this brew pot does not come packed with all the bells and whistles like other brew pots out there, the price is much more affordable. But just because they are affordable does not mean they are made cheap. 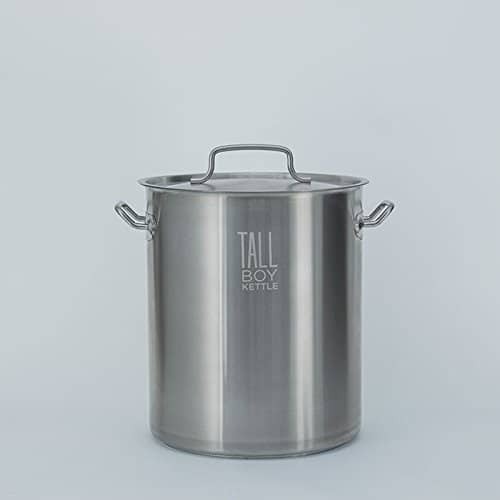 The Tall Boy is made of solid stainless steel with a 4mm thick tri-clad bottom that is specially designed for home brewing. The Tall Boy comes in 3 different capacity options: 8, 10, and 15 gallons. The Tall Boy does not come with the option to add a ball valve and spigot or built-in thermometer. The BrewBuilt Company has a very simple motto, “Designed for Brewing. Built to Last”. When you see one of their brew pots in person, you’ll see how they’re built to last. 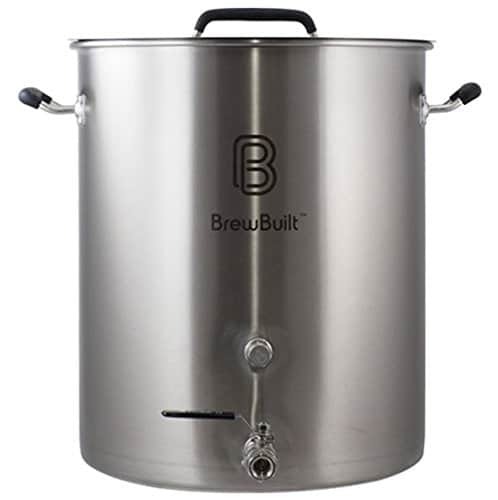 These are built from thick, high-quality grade 304 stainless steel that provides a less corrosive alternative to lower priced beer brewing kettles made from grade 201 stainless steel. The BrewBuilt Brewing Kettle comes with gasket free, welded in place couplers and welded on handles to give you an extra-long lifespan. That is a huge plus for me. BrewBuilt brewing kettles coming in 4 different sizes: 10-gallon, 15-gallon, 22-gallon, and 30-gallon capacities. 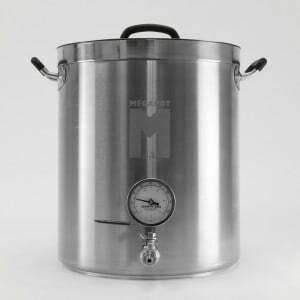 In addition to the various size options, it also comes with some great features that would only be available on a beer brewing specific pot. This includes the two couplers welded to the outside for hoses and spigots, a notched lid with a silicone plug for use with an immersion chiller, tie off hop bags, temperature readings and more. I find this beer kettle to be a great, affordable option! At 52 Brews, we usually review the top 5 best products, but this bad boy was something worth mentioning. 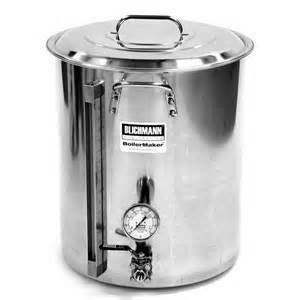 The Blichmann BoilerMaker is the considered the Ferrari of beer kettles, and there is a reason for it. This pot is built from a single piece of heavy gauge grade 304 weld-free stainless steel, providing outstanding durability and is designed and manufactured right here in the USA. The BoilerMaker proves that all stainless steel brew kettles are not created equal. It comes in 7 different sizes ranging from a small 7.5-gallon pot all the way up to a massive 100-gallon model. With so many sizing options, it makes it easy to get the perfect size for your home brewery. This model has all of the bells and whistles anyone could ever ask. These options include a 360° rotating linear flow valve, thermometer, external level gauge, and some of the larger models also allow an optional false bottom and their signature HopBlocker. What’s the Best Brew Kettle? Since a lot of these companies make such great products, it’s pretty hard to make a sincere recommendation without feeling like I am downplaying the other companies that didn’t quite hit that first place spot. If I were you, I would pick yourself up a Bayou Classic Kettle. It’s versatile and can be used for bag or all-grain brewing. This kettle is guaranteed to last for a long time due to the tri-ply bottom and the high-quality stainless steel construction. It’s also packed with features that are not included on any other brew pot. Get the best out of your brew without spending too much.